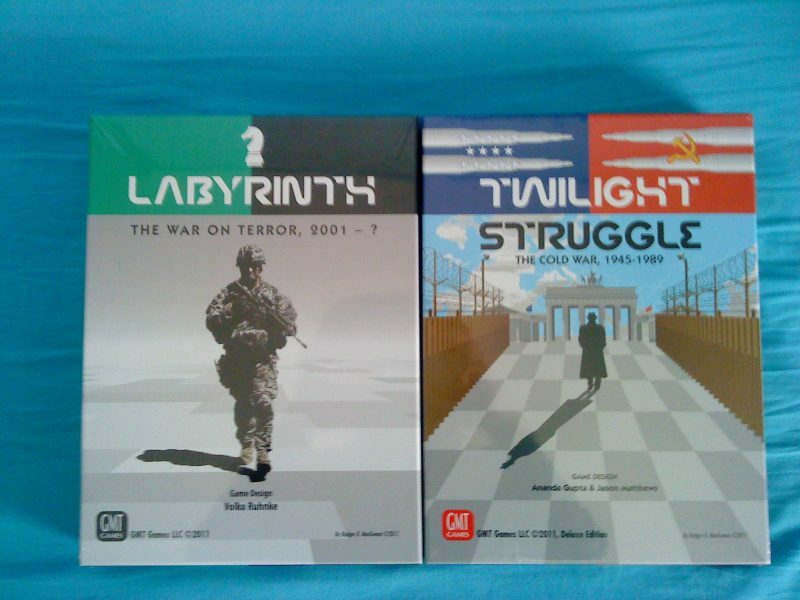 Labyrinth: The War On Terror First Impression Mission Accomplished? I don’t think I’ll create any controversy by saying that the War on Terror is, and has been, a mess. A war of intelligence gathering and ideology as much as it is about traditional combat, we’ve seen it stretch to nearly two decades now with even the definition of success nebulous and uncertain. I can’t imagine trying to create a game about the conflict, but wargame master designer Volko Ruhnke has done so with Labyrinth. I got around to playing this game after having played both Twilight Struggle, which influences Labyrinth quite a bit, and a couple of Ruhnke’s later designs in the COIN series. Nestled between those games chronologically, it’s sort of an odd amalgamation of the former’s brilliant mechanical ideas and the latter’s polish, but significantly weaker in many areas. See, Twilight Struggle introduced the idea that in a card driven wargame, where the action is driven by cards that offer specific events and/or operations values that allow one to execute standard actions, if you play your opponent’s card for its operations points, the event also happens. It loads tension into an already tense game. Labyrinth takes the same idea and uses it with a couple of small but important variations. These serve to weaken the mechanism, in my experience. Similarly, the later COIN games share much of the same DNA as Labyrinth but manage to fit a lot more game, action, and thematic cohesion into the proceedings. In the end Labyrinth feels like the odd cousin sitting between two behemoths of board gaming. It’s like going back and listening to the first EP of a band you really like and discovering that, while you can see some the elements in there that they later developed, it’s ultimately a bit disappointing when you start with their later work. Of course, this is just a first impression, which means that I haven’t played enough to be fully confident in my score or how the game will play to me in the future as I learn more about it. I think this is a perfect case study for why I like doing first impressions like this. This game is hard to decipher. Even though I had a much more difficult time learning the rules to Fire In The Lake, I felt like I had much more of an understanding of the different roles and strategies of the factions after a couple of plays than I do with Labyrinth. Given the subject matter that may be thematically appropriate. Enough of an introduction. 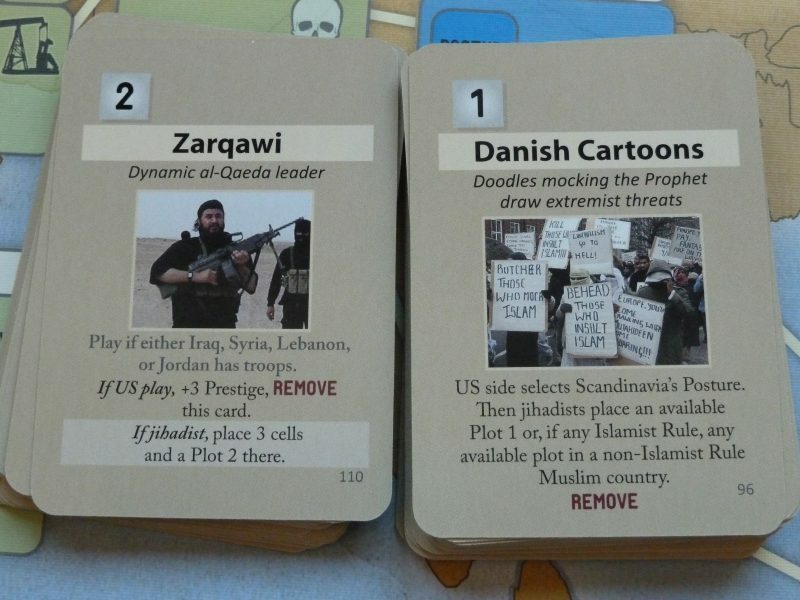 Labyrinth is a 2 player game where one side takes the role of the United States and the other side takes the role of radical Muslim jihadists. If you don’t feel comfortable with taking on that role in a game, I completely understand, although the game is abstracted enough that it doesn’t bother me. Of course, if we turn horrific events into a game and abstract the horrors into mechanisms, does that diminish or help our ability to understand the conflict? Does it help or hinder our ability to empathize with others? Like Twilight Struggle, Labyrinth takes a broad enough perspective to create a sort of unsettling realization that those in charge of orchestrating military actions do have to, at least temporarily, abstract individuals out of their calculations in order to be strategic. I think being aware of these tensions in ourselves as influenced by the game mechanisms is instructive, and Labyrinth not only facilitates that kind of response but it also simulates the broad diplomatic tensions the US faced after 9/11. It does this through two mechanisms. The first is the prestige track, which represents how well the US is perceived internationally. If the US player is high on the track, doing “war of ideas” plays in order to improve the government rating in a country will be a bit easier. If prestige is low it becomes more difficult. Certain events will force a roll for prestige, which is a randomizing event that can increase or decrease its value, although it’s weighted towards decreasing. 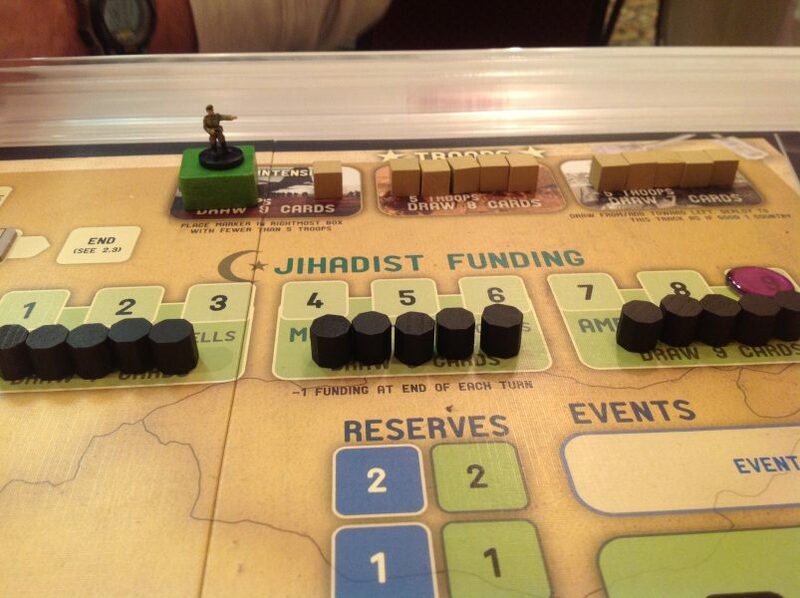 Finally, prestige bottoming out is part of one of the jihadist’s players win conditions. The second mechanism is a track that displays the overall strategic position of both the US and the rest of the western world–either hard or soft. If the US and the world are synchronized in this position it helps the US be more efficient, and quite a few event cards have conditional effects that involve this track. See, each side has instant and game-end win conditions. If the US has a certain number of resources captured with the “good” government designation, they win. If they eliminate all terrorist cells or have a certain number of total countries in “good” or “fair” designations, they win. The jihadists win by acquiring and planting a WMD in the US or by having a certain number of resources or countries in “islamist rule” or “poor”. At the end of the game, the victory is decided by the number of relative resources captured with “good” vs “islamist rule” designations. So it’s a back and forth pull between the two sides influencing countries, with variability through event cards and conditions determined by prestige and strategic stance. This sounds great! Unfortunately I find the execution on the details to create a somewhat middling experience, and so far I haven’t found my footing in terms of strategy on either side. It’s a tough puzzle to to crack, and while I generally consider that to be a good characteristic in games, I find it more tiresome with Labyrinth. The first difficulty is with the sheer number of cards in the deck. Twilight Struggle mercifully splits the game into early, mid, and late war decks, so you gradually get introduced to more and more cards. This helps not only thematically ground the game to time ranges, but it helps you in the process of remembering important cards. It also adds a layer to the game of deck management as you try to manipulate when cards are discarded and re-introduced to the deck to your advantage. Labyrinth has a single deck of cards, and while some significant events have multiple copies in the deck, I find it overwhelming to try to predict when cards will come up or do anything except figure out the tactical puzzle of my current hand of cards. That tactical puzzle is satisfying but I find the strategic element of understanding the deck to be either lacking or very difficult to figure out. Compounding this difficulty is the fact that many of the cards are conditional, which makes them more difficult to plan with and set up. Granted, many of the conditions are states you want to be in, but given that you have no idea when particular cards will appear, it becomes a hair frustrating when you see card after card with an effect you want to apply, but can’t because you didn’t meet the condition that you couldn’t have effectively prepared for. But the most significant issue I have with the game is the sheer amount of randomness involved. I enjoy how countries gain stances and government values as they become relevant–it creates a feeling of entropy when you’re on the US side and you see country after country get a poor government. But most of the actions in the game, and pretty much everything the jihadist player does, is dependent on a post-decision die roll. This creates extremely frustrating turns where you try to do 6 actions but are only able to accomplish 2 of them. Or maybe you want to do one particular thing in a country but spend turn after turn rolling poorly and accomplishing nothing. Again, this is less of an issue on the US side, but a significant portion of the actions in the game will literally do nothing because of dice rolls. And I understand why it’s there–it’s thematic. It’s hard to be a terrorist and move long distances. It’s hard to try to influence a country towards a more secular form of government. But when those frustrations are translated into these particular mechanisms it becomes annoying rather than challenging. I hate to compare this to Twilight Struggle once again, but I think I have to. Twilight Struggle is known for being frustrating. It’s known for turns where you feel like you’ve accomplished nothing. It even has actions where nothing can happen due to dice rolls. 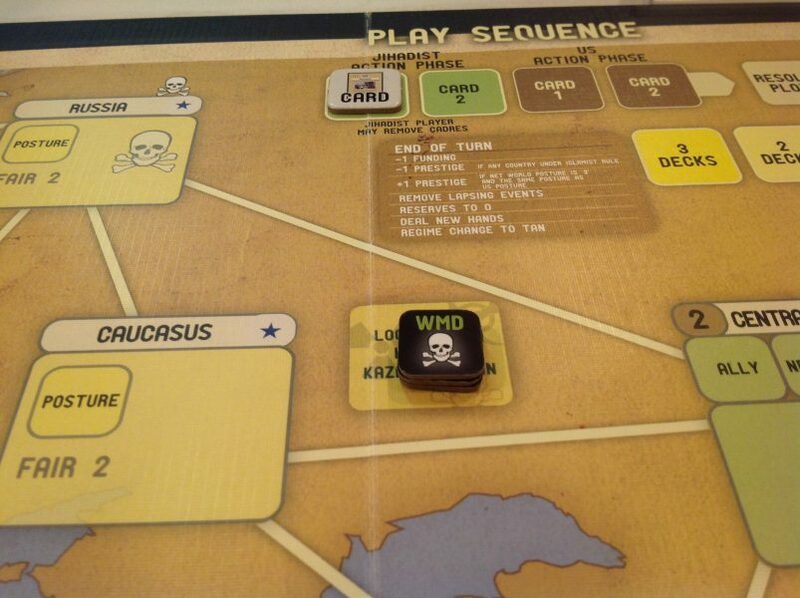 But not only are those actions limited, the frustration in Twilight Struggle comes from your battles with your opponent. You get mad because your opponent did something clever and devious. In Labyrinth I’ve only gotten frustrated and mad because I had a poor streak of dice rolling. That’s not fun. And that saddens me, because I love so much about the game and I appreciate many ways in which it simulates the conflict. I like how the US side has to balance its goals against the diplomatic pressures of its allies. I like how the jihadist side is always stretched for resources and time–they want to terrorize and influence everywhere but logistically cannot due to resources and geography. I like how enormously risky and taxing major jihads and regime changes are. You feel the weight of the resource drain. There’s so much to like here, and even as the dice frustrate me I have enjoyed the game. But it sometimes feels like a bit of a mess. I see the beginnings of what would become the COIN series and long for the more interpersonal–rather than strictly mechanical–web of interactions in Fire in the Lake or Falling Sky. I’m going to keep playing, though, and I hope that as I understand the cards better and figure out strategies I’ll be able to appreciate the game more and be able to ignore the frustration of the dice rolling less.